At NerdTechy, we’re constantly on the hunt for the next best portable speaker. But let’s be honest – there are a lot of options out there. No matter what your unique needs are, we can guarantee that there is a product already available that meets those needs. Despite testing dozens of different speakers, we don’t always come across something that comes across as incredibly innovative. 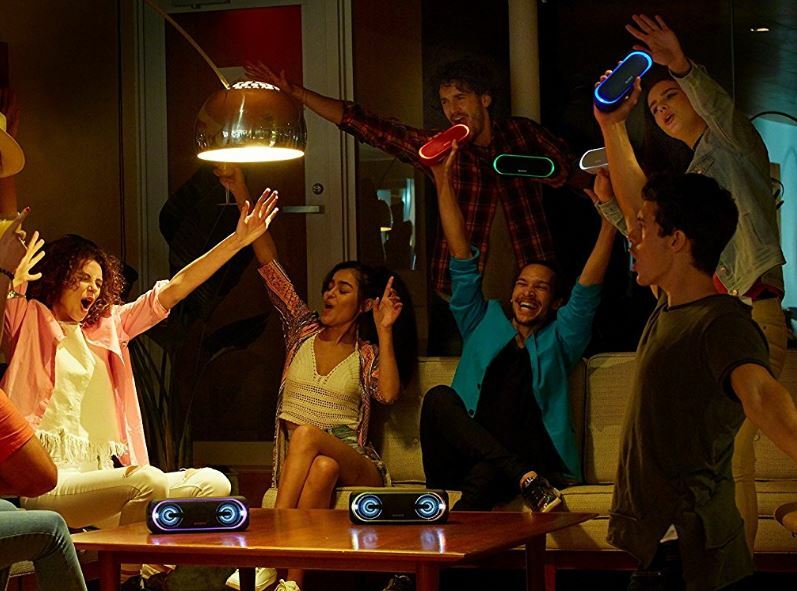 At least, that was the case until we tested Sony’s XB series Bluetooth speakers. What we liked about these speakers was the wireless sharing capability. Sure, many models of speaker allow you to pair a couple together to make a sound system. But these always require that you purchase multiple versions of the exact same model. This is where the XB series speaker is different. Any model within the XB line can be paired together. For consumers, this makes more sense. You can have one tiny model to take with you on your bike, and a larger one for use in the home. But that’s not all that we liked about the line. Let’s go hands-on and find out how the XB30 compares to it’s siblings. 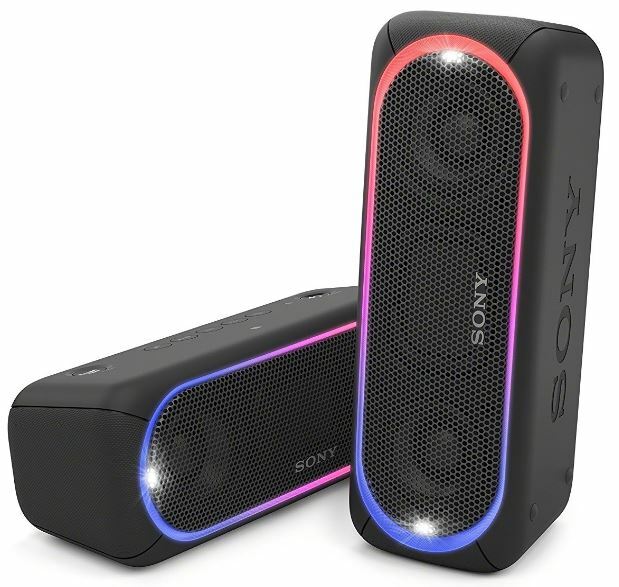 The Sony XB30 is one of the highest-ranking models in the XB line. It’s older brother, the XB40, is physically similar in design. The differences lay in the lighting. The XB40 has sprung for an advanced lighting system, where the XB30 keeps things simple with a more modest system similar to that of the XB20. The main upgrade from the lower end model comes from the speakers. With a larger case, more powerful drivers are used. There are two dedicated drivers, plus an additional passive radiator that provides additional room for air movement. Overall, this is a speaker that puts sound quality first, and doesn’t come with a lot of unnecessary frills. The scratch resistant rubberized finish of this speaker has a very appealing visual design to it. Although it’s much boxier than some models, it’s heavily rounded corners and tapered enclosure give it a very sleek and modern appearance. When you pick it up, you can tell that this speaker has quite a bit of heft to it. It feels very solid in the hand, which was the first cue that it was highly durable device. Because of the rubbery finish, it feels well padded. Not so much like a brick, but more so like a well-designed speaker that can stand up to the use and abuse of daily life. According to Sony, it’s drop and water resistant. We dropped it from a moderate height, and saw no deformation or damage to the enclosure. Because of the material it’s made of, the enclosure doesn’t show any scratches or dents, keeping it looking pristine even after heavy use. Having attained an IPX5 rating, this speaker is clearly designed for outdoor use. It’s resistant to both liquids and dust, so you can use it in any environment you see fit. What we like about this speaker is that despite being durable, it’s still very stylish. You can pick from four different bright hues: red, blue, white, or black. Each model has an LED ring that goes around the speaker grill. The colors are matched to the enclosure, and can be controlled from the included app. There is a definite improvement in the sound quality from the cheaper XB20. The speaker sounds precise, controlled, and (most importantly) loud. With almost no distortion, it’s capable of filling an entire room. It doesn’t matter if you’re having a little private dance off while cleaning the house, or if you’ve invited all of your best friends over. Just a single speaker can competently fill a room with razor sharp highs, a smooth midrange, and slamming bass. As you can probably tell by it’s Xtra Bass designation, the low end is a particular selling point of this speaker. Here’s the thing with bass. In order to make a deep sound, you need a lot of air in the speaker cabinet. Because this speaker is so compact, you’d think that it wouldn’t be able to produce quite as much sound. But there is something unique about this model. The large square looking speaker in the center is called a passive radiator. There is no driver attached to it. When the drivers pull in, the radiator moves out. When they push out, the radiator pulls in. This essentially acts as a second diaphragm, creating the same kind of bass you’d get from a much larger speaker. Whenever you like, you can flip the bass button on the top to enable an additional EQ that increases the low end. We found this feature to be best for hip-hop and electronic music, where the bass is a major portion of the sound. But the power of the bass is really enhanced by the fact that you can turn it on or off. When in standard mode, the sound is very clear and detailed – something you’d look for in an audiophile grade speaker. But when the situation calls for it, you can hit a single button and completely change the sound to something much more pronounced than any other speaker we’ve tried. After spending some time using the speaker, it was obvious to us that Sony had spent quite a lot of time making sure everything was in order. The biggest upgrade with this model was the battery. It lasts for 24 hours of straight continuous playback at 75% volume. And you can trust us, you’ll rarely want to go louder than that. Surprisingly, battery life didn’t seem to improve much at lower volumes, but 24 hours is still a very long time for a speaker like this. Another thing we liked was the controls. As speakers become sleeker and more visually appealing, many manufacturers have tried to “simplify” the control scheme. As many of us have learned the hard way, simple control schemes that use a couple buttons to control everything are often a big pain. But Sony gives you a dedicated button for every major feature, so it’s still quite easy to use. You can also use Sony’s free app to control the speaker. This gives you a few extra options. For starters, you can control the light show on the front of the speaker. This is great when in a social environment, or even if you’re just looking to spruce up a dark room. But the best feature in the app comes from the ability to pair multiple Sony XB speakers together. Match a pair of equally matched speakers to create a stereo system. Or, you can use the party mode to daisy chain an unlimited number of speakers. This is great for whole-home sound systems, or to keep the music going even at a larger outdoor event. The Bluetooth chip is the latest model, supporting lossless audio while using very little power. However, as an added benefit, Sony is using a unique LDAC protocol. This allows for higher bitrates, ideal for anyone who is playing back FLAC files or Spotify’s “ultra” quality sound. You’ll also find this speaker easier to pair with thanks to NFC. Just tap your phone on the top, and you’ll be ready to play back high quality audio. 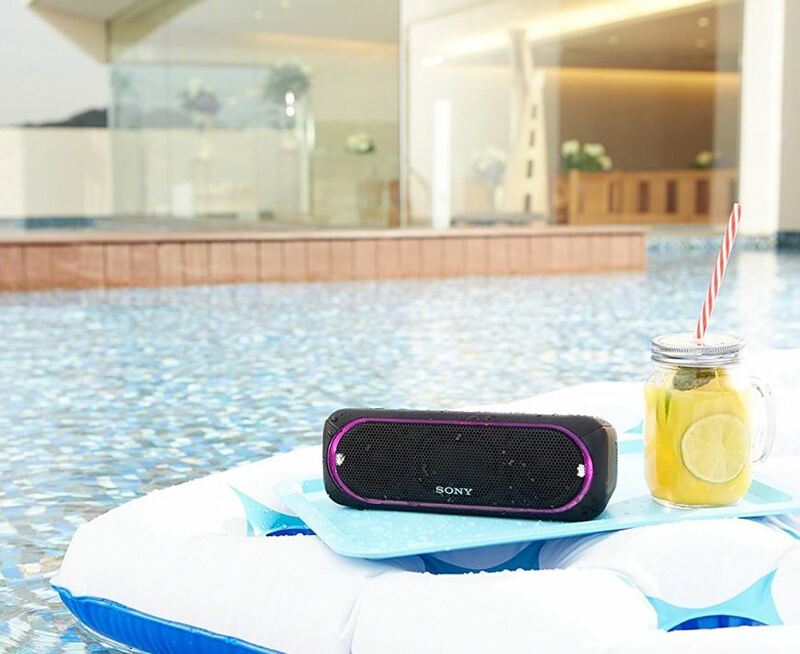 The only real disadvantage to this speaker is that you need to use Sony’s SongPal app to access some of the more advanced features. It’s available on both the App and Play stores, but takes a surprisingly large 44mb of space to install. Why would a simple app require so much storage? We’re not too sure, but hopefully you’ve got a little extra space in there. 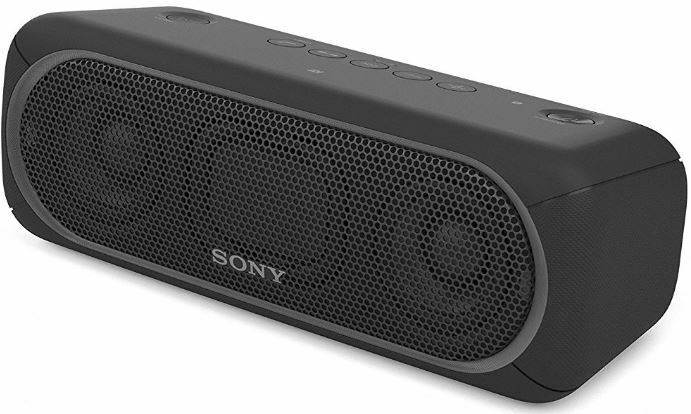 We’re huge fans of the Sony’s XB series Bluetooth speakers, and the XB30 is the best bang for your buck. It offers the same impressive sound quality of the XB40, and only sacrifices some of the advanced lighting. But where functionality is concerned, they are nearly identical. The biggest draw to this speaker is the sound quality. It definitely sounds above average, and we’re certain that you’ll be impressed. If you’re looking to save a few bucks and don’t plant to play your music very loud, you can easily exchange this model for the XB20. Or, if you really want to liven up the party, a few extra bucks for the vibrant XB40 might be worthwhile. Finally, the XB10 is a great option for anyone who needs an ultra-compact speaker. No matter which option you choose, we’re confident that you’ll love the XB series speakers. It’s apparent to us that Sony has a lot of experience in this market, and you’re buying into an ecosystem that is a few steps beyond what any of their competitors offer.